First the exciting stuff! Lindstrand Balloons published Issue2 of their Service Bulletin No12. Dated 10-05-2012 it refers to the Female ACME Thread Connectors (Rego type). These are the ones fitted on the ends of the hose that connects the hose to the cylinder. The amendments are correction of duplicated serial numbers and additions in the list of known locations. The supply period of the connectors remains 01-01-11 to 1-09-11. 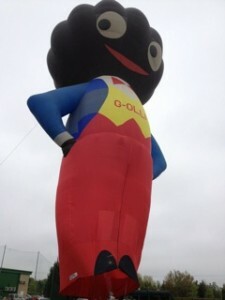 Any problems, or to download the SB, contact Lindstrand Balloons or your local inspector. 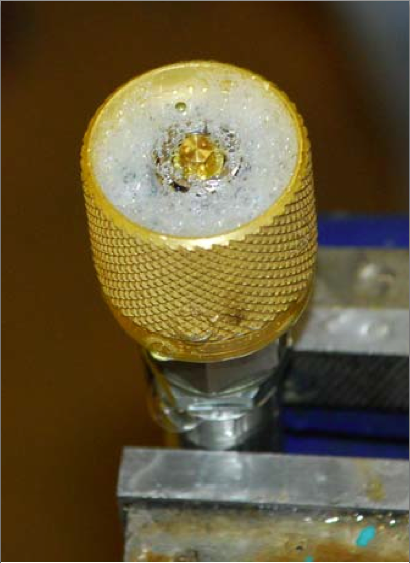 If you come across an affected connector it needs to be sorted and the form attached to the SB should be completed and sent to Lindstrand Balloons along with the connector if necessary. We still get calls about Cameron cylinder lifing. The life requirement on all Cameron controlled cylinders has now been removed. Aluminium Worthington cylinders have never been lifed. For those that ask where it says that in the Manual, it doesn’t! If you own a Cameron, Sky, T&C (and derivatives) balloon the appropriate Maintenance Manual (MM) that contains the Maintenance Schedule that does not have lifing requirement in it is Issue 10 Amendment 3 (issued on 21/12/11) which can be downloaded for free from their website. The Maintenance Schedule appears at 6.1 and this is what your balloon is inspected to. It doesn’t mention lifing so there isn’t any. Read the requirements and you will find that you must always work from the current (latest) Maintenance Manual. The Flight Manual is a different thing OK? You must print the Maintenance Schedule out and attach it to your Maintenance Programme (MP), that six or seven paged document issued by a CAMO (to make it simple). In the case of the BBAC MP it will be BBAC-TC-004. (i) PRVs have a five year shelf life. (ii) If fitted at the same time as the PPT (Proof Pressure Test) and they are no more than five years old when fitted then they will need changing at the next PPT. (iii) For existing fitted PRVs, provided the date of fitting is known, they are lifed for ten years from the date fitted. Generally this means that PRVs previously fitted at the same time as the PPT (provided they are no more than five years old) can be considered to meet the requirement and be changed at the same time as the next PPT. (iv) The date of original fitting of the PRV is the date the ten year period runs from. This means that in the case of PRVs not being replaced at the same time as the PPT was carried out (as they may have had some years still remaining) will have to be replaced on the anniversary of their fitting date. (v) In the case of an already fitted PRV where the date of fitting of a PRV cannot be ascertained then the PRV life is 10 years from the date of manufacture as stamped on the PRV. NO!!! Just to be perfectly clear, you cannot remove a PRV, clean it and refit it and pretend it has just been fitted. OK? Got that? Good. It will have Form 1 number and jobsheet reference somewhere so don’t even think about it. Right, onto……. While we are doing confusion….if you have updated your Cameron Flight Manual to Issue 10 Amendment 10 then you need to check that you have the correct Supplements. Which Flight Manual you need depends on the age of your balloon and the equipment you use. If you click on the ‘Manuals and TCDS’ page on the left hand of this site and scroll down to the respective manufacturer then you will find the requirement there. For example, if you have Worthington, Titanium or some stainless steel cylinders and are operating your balloon under the current Flight Manual Issue 10 Amendment 10 then you will need Supplement 8.39 ‘Out of Production Cylinders’. Courageous crew Andy Austin and Martyn Turner took Halycon for its second maiden flight on 6th May after a break of 21 years it flew fantastically. 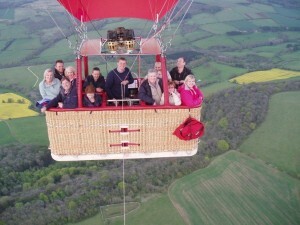 It took to the air with its Hot tom burner which made them chuckle (afterwards!) See the article for more on their historic flight. Right, next….. Ever since the hose-pipe ban was announced it has been raining or about to rain. The past few months continuous rain and drizzle has meant that many of the ride Many Ride Operators have decided to suspend flights until the ground dries out. The long range forecast seems to suggest that the present trend of weather will probably last until the end of the month but it is starting to improve here and there and there may even be a few slots this week or so. Last year we also had an good early start to the year with May proving a big disappointment. We are equally gutted. Badminton Horse trials were cancelled and our own Chiltern Hills Old & Rusty gathering was cancelled. Now what you don’t need is a traction engine stuck in the mud! It seems that generally Ride Operators are all reporting lower sales than last year. Whether this has more to do with the weather and absence of balloons in the sky or the recession no one will say but with some prices now lower than they were when passenger flying became legal there does seem to be an all out price war to woo customers and some bargains to be had. The cost of a balloon ride is dramatically lower than the hourly rate of the averagely flown private balloon. Now there’s a thought. 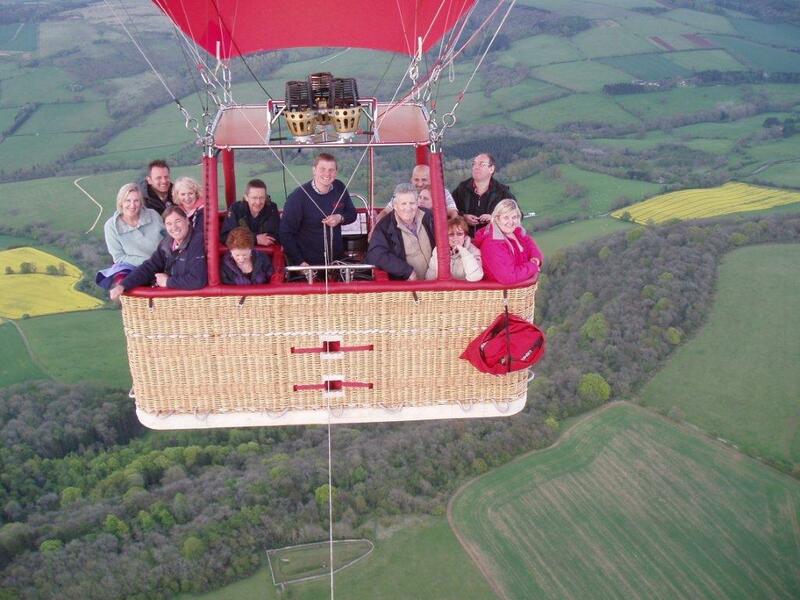 Enjoy a balloon flight, get free champagne, don’t pack it away and leave the grumpy farmer to the Pilot! Oh nearly forgot, and claim for a broken fingernail! This past week or so has been a bit jet setty to say the least. On Sunday Barry the Computer and I went out by boat to Normandy to inspect the Chateau Balleroy G-BTCZ and G-BYJW shapes. Tuesday saw a very wet 400 come in for a small repair, John nearly getting electrocuted in the process as a thunderbolt clapped overhead. On Wednesday all three of us flew to Germany to inspect Action Man G-CGIS and Baby bel G-BXUG and the balloon used in the film Enduring Love (dreadful book, dreadful film!) G-CCIU which now lives in Germany. Naturally local traditions were observed and enjoyed by all. Fuller reports underway!! Team Wellick went to Waddesdon Manor Sponsored Ride on Sunday and, as ever, came out well in the rosette stakes. Frank though didn’t fair so well despite passing his plating last week. 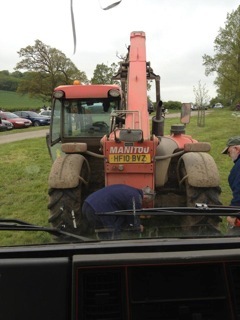 Despite the soft going Waddesdon went ahead with the event but the parking conditions were less than favourable with a Manitou required to heave frank out of the gloop, almost bogging down in the attempt. I expect a receipt will be presented in due course!! Meanwhile, back at the ranch, Rosey the foal continues to grow and is now quite hardy spending most of the day careering around the field and crashing out in the stable at night. 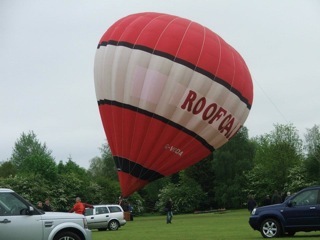 The old Vodaphone balloon G-VODA has now been rebranded as the Roofcare balloon. Purchased by Howard Cusden of Northampton G-VODA was originally built for Vodaphone Newbury in 1990 and was regularily seen on the circuit before being purchased through the Zebedee List in February. Howard was trained by Jamie Edwards and is a member of the Molly Mae Balloon Team. Howard runs his own specialist roofing business, Roofcare, based in Northampton. The artwork was done by Pete Bish and the Zebedee team and very nice it looks to. If you have an altercation with a roof on finals give Howard a call on 01604 585150, he’s your man.